The feasting and noise from the Hall, night after night, seriously disturbed the neighbours. Especially irritated was Grendel. Not so much on his own account as for his mother. The Dame, was getting on in years and needed her rest. Ever since Rothgar and the motorcycle club he called his Thanes had moved in, the Dame had lost more and more sleep. She was becoming increasingly peevish. She tended to take this out on her son, which he did not enjoy. One night, when the din from the Hall was particularly loud and had gone on for a particularly long time, Grendel’s Dame became particularly upset. Finally Grendel exclaimed, “No, no. This simply won’t do!” Putting on his cardigan (for the early autumn mists were chilly), he strode across the road. The new gate was ridiculously ornate with “Heorot Hall” in curlicues of wrought iron. Very much out of place in this street. Rothgar and his people were really dragging the neighbourhood down. Property prices would plummet. Grendel marched up the drive to the front door. He rang the doorbell and hammered on the door. To no avail – the noise inside was too great. Exasperated, he tried the door and to his surprise found it unlocked. He pushed it open and stepped inside. The noise outside was as nothing to the volume within. Raucous music – Grendel assumed it was supposed to be music – bellowed from amplifiers. Voices were raised in song or argument. The entrance hallway was packed with long-haired louts. Sweaty drunks in boots, jeans and leather waistcoats, they stood in groups, leant against the walls or sat on on the staircase. Blear-eyed, they clutched cans of lager or passed fat, poorly rolled joints from hand to hand. It wasn’t obvious at first, but after a moment Grendel realised some of the brutes in the hall were women. Somehow this made the whole scene even more gross to him. Shuddering, he looked about for Rothgar. The man was not to be seen. Barely able to hear himself think, Grendel touched the arm one of the louts standing near the door, meaning to ask where Rothgar was. The man looked at Grendel and all the blood drained from his face. This was made the more dramatic because he had a particularly red face, with bloodshot eyes and a glowing nose. But looking at Grendel he turned pale. Paler than pale. His eyes rolled back in his head and he crumpled to the floor. Perhaps a heart attack? But really, Grendel thought, how exasperating. It’s not my job to take care of the fellow. Tut-tutting to himself, Grendel stepped over the inert body and grasped a second man on the shoulder. This man looked at Grendel and took in his long face, his horn-rimmed glasses, his cardigan (knitted by the Dame herself) and then saw his fallen comrade. He stepped back, a look of confusion, loathing and utter horror twisting his face. Already unsteady, his heel caught the foot of the stairs and he tripped, falling backward. His head clipped the edge of one of the stone steps as he went down. The noise of his fall must have been prodigious, for he was a large man, however any sound he made was quite drowned by the volume in the hall. To Grendel it looked almost as if he fell in silence. This was becoming ridiculous. Grendel turned to a third man leaning up against a newel post . This man had clearly been watching Grendel’s progress. Now, as he realised he was next, the fellow’s alarm was obvious. His knees gave way and he slid down the wall, turning his head to vomit as he did so. “Oh, really, this is too much!” Grendel was quite disgusted. Now a woman saw Grendel surrounded by bodies. As the third man keeled over, she suddenly screamed. At last something that could cut through the noise in the hall! Someone switched off the music and the shouting and singing died away. Grendle was conscious of standing in the middle of a crowd who looked increasingly as though they would be happy to beat him to a pulp, but no thought of personal safety disturbed his righteous indignation. “Where is Rothgar?” He demanded in a loud voice. “He’s gonna kill Rothgar,” screamed the woman. But he was cut off as one of the louts swung at him with what seemed to be a chain. The man was as drunk as all the rest and Grendel had easily enough time to dodge the blow. The weapon, missing its target, struck the face and neck of another man in the crowd, who screamed in pain. Now the noise was back. The brutes who filled the hall were howling and cursing and all sorts of weapons were appearing in their hands. Knives, knuckledusters, chair-legs, baseball bats. (Grendel had time to notice there was not a single honest cricket bat.) But space was at a premium and the bullies’ hand-eye coordination was not of the best. One brute grabbed at his arm and somehow hooked his fingers in the loose knitting of the cardigan’s sleeve. Flailing back, the man ripped the arm from Grendel’s cardigan. The Dame was going to be furious, Grendel thought. The fight raged on. Grendel was scratched on the cheek, but the damage the louts managed to inflict on one another was infinitely more serious. Soon blood was splashed on the walls and bleeding men and women were crawling on the floor, trying to get out from underfoot. Finding himself back at the front door, Grendel decided discretion was the better part of valour. He slipped out and walked home thought the fresh evening air. His left arm felt a little chilly without the comforting protection of his cardigan sleeve. How would he break that news to the Dame? He decided to put off telling her. The corners of Grendel’s thin-lipped mouth rose slightly in a wry grin. Standing in the bathroom later, dabbing antiseptic on the scratch he had received, Grendel smiled again. The idea of his mother going over to Heorot Hall and her reaction to the scenes he had witnessed struck him as amusing. They really wouldn’t know what hit them, he thought. For the real story I warmly recommend Seamus Heaney’s translation of Beowulf. 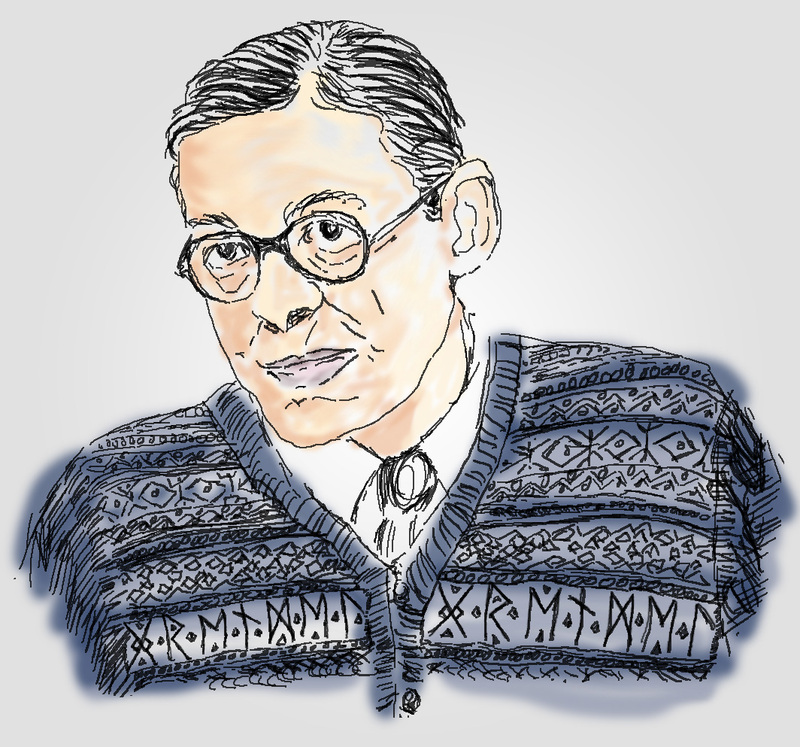 The illustration of Grendel the Stockbroker is based in part on a photograph of TS Eliot, who was a major poet and also a banker. Two things that, as with Grendel and stockbroking, just don’t seem like they ought to go together. The runes Grendel’s Dame knitted into his cardigan mean something. I used to know what, but I’m afraid I’ve forgotten. Maybe you can work it out? I first published an earlier, shorter version of this story in my separate Articulations website in the summer of 2013.